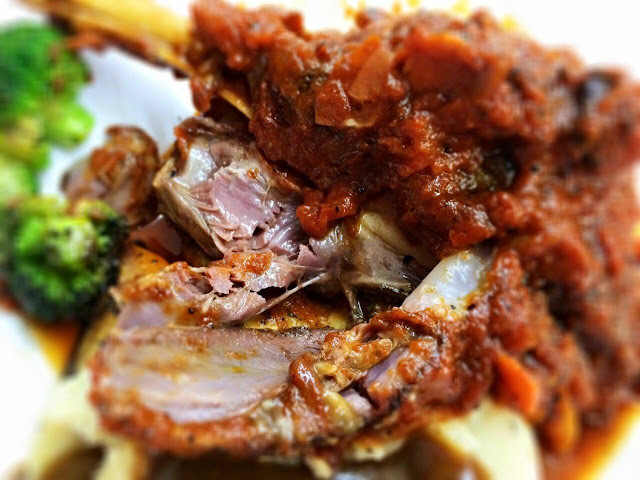 Pork ribs and lamb shanks, the new stars in the evolution from coffeeshop western food to coffeeshop western cuisine! Let me start this post on western food in Singapore by giving a brief scene of how old school coffeeshop western food used to look like to true blue old school Singaporeans. 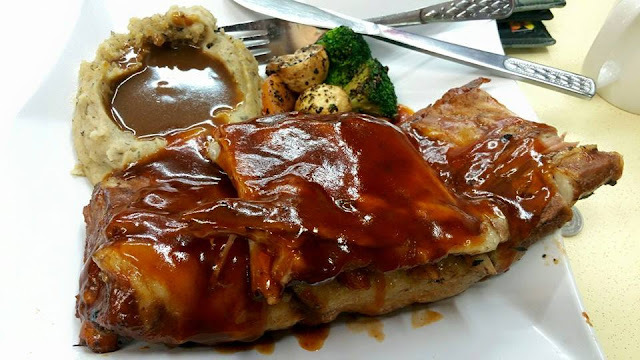 I remember old school western food by the mini portions of "Anchor" butter which came with a small bun, old school no brand thick french fries, baked beans and the main piece of meat which was chicken chop or chicken cutlet with brown sauce as a default. The other mains that one would choose would be fish and chips, pork chops and the ever popular mixed grill which always came with sunny side up eggs, sausages and mixed grills. Burgers would be limited to chicken or fish patties with only a slice of cheese. Some stalls would also throw in fried or BBQ chicken wings for those who wanted rice or extras to go with their mains. All this for the price of $4.50 for chicken chops and $8 for mixed grills. Does this description bring back memories of how coffeeshop western food was to you? If it does sound nostalgic to you, that's because it no longer exists now. When was the last time you saw the small packs of Anchor butter or the forks & knife wrapped in a single thick ply of tissue? Coffeeshop western in Singapore has been reshaped by the days of Astons & Botak Jones and the industry has had to evolve to cater to new found Singaporean demands of western food. Look at ABC Grill, Happy Western or even Char Grill Bar (the not so new kid on the block). All of these coffeeshop westerns have modified or changed their menu and way of business. Gone were the days of only french fries or baked beans as fixed sides. Many coffeeshop westerns now give you a mix of sides to choose from and they can range from fancy baked potatoes to cheese soaked fries. Coffeeshop western stalls have setup franchises, expanded everywhere and have even brought in premium western cuisine that you might only find in a restaurant. Astons started bringing in baby ribs and sirloin steaks, Happy Western did some chicken and pork schnitzel, Botak Jones did premium beef burgers and Char Grill Bar did grilled salmon steaks. I'm going to talk about Adrian's food again but for a good reason. Chef Adrian (Crazie Chef) has broke common boundaries that none of the coffeeshop westerns have dared to cross. Not only has he brought western cuisine to the coffeeshop, he has done it in style by marrying both price and quality of food. 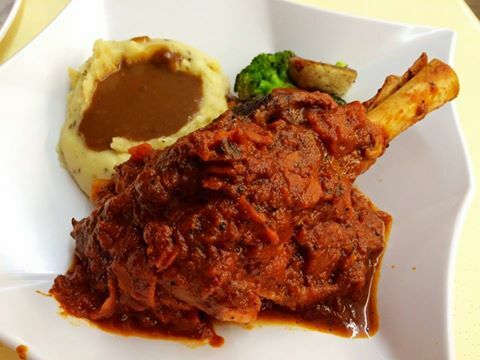 His two recent "high class" or atas dishes are his Napolean Lamb Shanks and BBQ Pork Ribs. It has impressed me for sure and even a famous food blogger (who we shall not name now) came by to try those dishes. Chef Adrian also gives some sort of customization to regulars or ardent customers who call him to reserve Ribeye Steaks. Customers can order a pre-determined weight for their steaks and that is how I got to try 200g, 300g, 400g and even 700g! I finally settled at 300g as I found that was the best weight for eating Ribeye. Anyway, while the two "high class" dishes are not priced at usual coffeeshop prices (the lamb shank is at $27 +/- and the BBQ pork ribs at $19.90 for a slab), I wish to shout out that there are NO coffeeshop price references for lamb shanks and BBQ pork ribs in a coffeeshop! I mean when we talk about having the best BBQ pork ribs, lamb shanks or ribeye steaks in Singapore, you won't even think of a coffeeshop in Crawford lane right? Well, heads up! Chef Adrian is looking to bring in top grade Wagyu steaks to his stall so have a look out for that. He's also toying with his signature Beef Stew and Pork Chops... stay tuned for more meat!